Taking approximately an hour to install, this window kit designed to fit into the 29"x16" shed design is the perfect way to add light and air to your storage shed. A perfect addition to your storage shed with easy installation. TheDuraMate 8'x8' shed can accommodate up to 3 window kits, one on each side and one in the back. 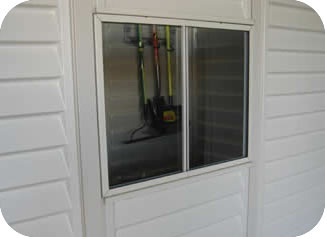 You can add 2 windows to the 5'x8' YardMate shed on either side. The 8'x6' DuraMate can accommodate a window on the back wall and the 4'x8' SideMate shed can have a window on each side. For 10' sheds please visit the08211 window kit. Note: The 5'x3' or 5'x5' YardMate models are not compatible with window kit. Competitive Edge Products, Inc. is an authorized distributor of08111 Duramax window kit. Q: 00221 shed will this work with that shed or can I also choose the larger size? Q: Do you have to take off the roof to install the window if you order them separately? A: Most customers simply purchase this accessory before the assembled or storage shed. Yes, if you purchase this after you have completed your storage shed assembly you will need to remove some roof panels so you can remove the wall panels. Fast Shipping: Orders for the Duramax 08111 generally leave the warehouse within 1-2 business days.